Ansible is a simple, agentless way to automate your infrastructure. If you find yourself deploying WordPress over and over again, Ansible could save you a lot of time. With a few lines of YAML (a straighforward markup language), we will automate the typically tedious process of setting up WordPress on a fresh Ubuntu 14.04 server. We will install WordPress more or less according to the process outlined in this tutorial, but automatically. We will use two servers: A build server running Ansible, and a target server on which we will install WordPress using Ansible. It is faster but less secure to use passwordless sudo access on your wordpress-server. This has to be the last line in the file. It is important that this is the last line, otherwise it will be overridden. NB: Always edit the sudoers file using the visudo command. This will verify your changes before saving the file - this can save you from accidentally locking yourself out of the machine completely. Now, throughout this tutorial, you can run the ansible-playbook commands without the -K flag, so you don't have to enter the sudo password manually. In this section we'll install Ansible on your build-server. Now that we've installed Ansible, let's get prepare the file structure for our Ansible playbook. Create a directory for our playbook. You'll notice that this creates a whole file structure for each of our roles. This is in accordance with Ansible's best practices. For the most part we will be concerned with each role's tasks/main.yml file. In this section, we'll write the commands to install WordPress on our remote server. An Ansible inventory informs Ansible about what servers we have that we want to install WordPress on. We can run our playbooks for the servers or groups of servers defined in our inventory file (hosts). Our inventory is very simple. You could put a number of different IPs under the [wordpress] group. This would cause the commands to be run on all servers listed here, provided you have access set up on all the servers. This would let you install WordPress on a number of different servers at once. We can think of a playbook as the definition of our WordPress app. Our playbook will combine the roles we created to configure a useful application (in this case a WordPress site). Enter the sudo password for your sudo user on the wordpress-server when prompted. This indicates that we were able to connect to the server. However, we haven't defined any plays yet, so nothing was executed on our wordpress-server. Let's fix that by filling out the details in our four roles. If this was not successful, double-check that you can SSH from the build-server to the wordpress-server using an SSH key. First things first; let's set up our server. For this we'll be editing the server role. If you're interested in the details of what we're installing, you can have have a look at the tutorial on how to manually install LAMP on Ubuntu 14.04. After running this, you should be able to access the default Apache page at http://wordpress_server_ip/. Awesome. Apache is now installed and running on the wordpress-server. If your build hangs indefinitely at the point of TASK: [server | Update apt cache], this can indicate a lack of permissions on the target server. Make sure sudo access is configured properly on the wordpress-server. This will install the required PHP extensions. We also need to set up a MySQL database for our WordPress site. We'll do this in the mysql role. We're going to need a few variables for this one. For a role, you can specify default values for any variables in the defaults/main.yml file. Add your database name, database username, and database password (that you want to create), in that order. Make sure you pick a secure wp_db_password. Add the tasks to create our database and a user to access it. The variables are pulled in automatically from our earlier file, so you don't have to change anything here. You might be interested in encrypting your password. Ansible provides ansible-vault as a utility for this, but a full discussion of ansible-vault is beyond the scope of this tutorial. And now, the moment we've all been waiting for... WordPress! With the server requirements installed, we can set up WordPress. We'll be editing the wordpress role. We're adding a few different tasks to the roles/wordpress/tasks/main.yml file, so keep it open for this section. You'll notice here that we've added a notify block. This is used when you need to perform tasks such as restarting services after a task has successfully completed. notify handlers will only be notified if our task is changed. This handler will be called when a task that specifies notify: restart apache is changed, causing the server to restart Apache. This task will find the lines containing: DB_NAME, DB_USER, and DB_PASSWORD in our config file and replace them with the variables from our playbook. After successfully completing the steps above, our wordpress role will contain two files of interest. You should be able to view your WordPress site online at: http://your_server_ip. 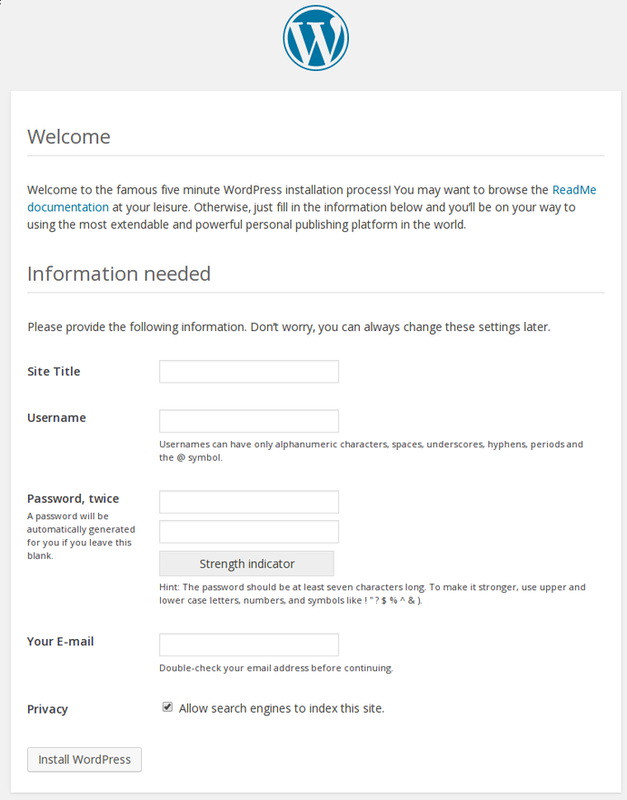 You can complete the manual WordPress site setup from here. All you have to do is add the IP address of your target server to your hosts file and make sure your permissions are set correctly.